September 12, 2018 at 11:35 am. Philadelphia Eagles quarterback Nick Foles will be under center for Sunday’s road game against the Tampa Bay Buccaneers, coach Doug Pederson announced Wednesday. Pederson said Carson Wentz has not been cleared for contact, thus giving Foles the nod. Wentz’s status has been a hot-button issue as he continues to rehab from a torn ACL and LCL sustained in December during Philadelphia’s march to a Super Bowl title. Foles stepped in and played superbly in the team’s championship run, winning MVP honors in the Super Bowl after leading the Eagles to a 41-33 win over the New England Patriots. Because of concerns of Wentz’s recovery, Philadelphia wisely restructured Foles’ contract during the offseason to provide a reliable backup option. 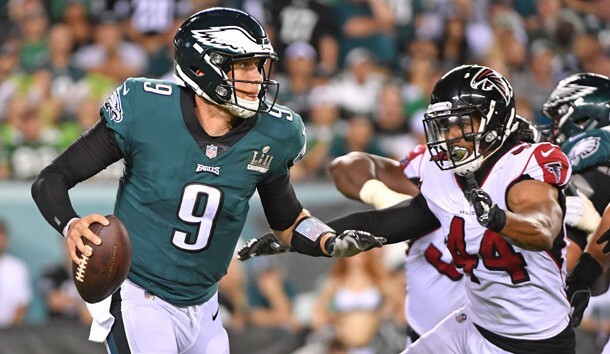 Foles struggled throughout the preseason and labored in Thursday’s 18-12 victory versus the Atlanta Falcons, completing 19 of 34 passes for only 117 yards. He also was intercepted, sacked twice and fumbled, although the Eagles recovered. The 29-year-old Foles did lead the Eagles on an eight-play, 54-yard winning touchdown drive in the fourth quarter that culminated with running back Jay Ajayi’s second score of the game, an 11-yard run with 2:19 remaining. The 28-year-old Jeffery was bothered by the shoulder injury in 2017, but still had 57 catches for 789 yards and nine touchdowns in the regular season. He added 12 receptions for 219 yards and three touchdowns in the Eagles’ three postseason games en route to winning the Super Bowl. Jeffery had surgery to repair the shoulder problem the season, which was his first with the Eagles. For his career, Jeffery has 361 receptions for 5,338 yards and 35 touchdowns in seven seasons. He was a Pro Bowl selection in 2013.